In college, we had to take the Meyers Briggs personality test – which I actually found to be pretty accurate. And just in a breif version now, I’m still the same personality type today. But I think one part has gotten even stronger…judging. No, not what it sounds like. A judging personality prefers to have matters settled. Likes to make plans and details on what one is jumping into. A judging personality needs details and lists. And if we’ve met? You know I love me a list (Stop laughing, Marilyn 😉 ). I reached out on Facebook to my friends about the best way to keep notes in your phone and on your computer. The unanimous decision was Evernote. I quickly downloaded it and then began to transfer all of my notes from my Note app in my phone over. It took me a few weeks to get really used to it and organized in a way that works best. But now? It. Is. Awesome. In general, I keep a running To Do list broken into work, writing and life. There are sub categories from there, but it gives me a quick and dirty. I can update it at school from my phone and when I get home and sit down at my desk, it’s there to remind me to order party table cloths. I can also print a hard copy which I love for the visual reminder at my desk. I keep my grocery list, Target list and Costco lists there so when we’re in the car and a kid says “can we get popcorn at the grocery?” I can add it in and avoid the sad frowny face when I realize I forgot to purchase said popcorn because my list wasn’t handy. Now, my list is always handy. I am just starting to try the “clipping” feature where you can put pictures, websites, etc. I love this because I always see a sign for something, or a website I think is neat and now I can clip it into Evernote rather than save the bookmark. And it’s allll in one place. One place! Everything! Get downloading. You’ll thank me when you never forget something on your grocery list again. Any time I flip through a magazine or catalog, I always sigh when I see neatly organized “catch all” or mud rooms. I love the idea of having a place to house all the stuff needed for activities, school and life. This is our finished catch all and I love it. It makes clean up easy (ok, slightly easier) because everyone can put their bags, gear and or reminders in one space. Plus there’s not back packs and soccer balls every where. Or at least in theory. This bench is an antique that has been in our house since I was little. It sort of floats around rooms, but it always works. The mirrors and the baskets are Target. And the shelf is courtesy of Peter and his amazing carpentry skills. I love the baskets. They make storage so pretty. And yes, having a crap basket is totally necessary. One organized living solution that keeps my sanity is to have a bag for each activity. Swim, dance, soccer, softball – all of them get a bag. Then at the end of each game or practice, all the crap goes back into the bag. That way there’s at least a fighting chance of finding soccer balls and TWO shin guards. And that orange bag? Is a life saver! It has pockets surrounding the inside and the wide opening means everything is easily accessable. It’s called The Game Day Tote from Simply Steph’s Monograms on Etsy. Tell her I sent you when you order yours. Need ideas for your mud room? Head on over to Pinterest and get ready to lose a few hours. 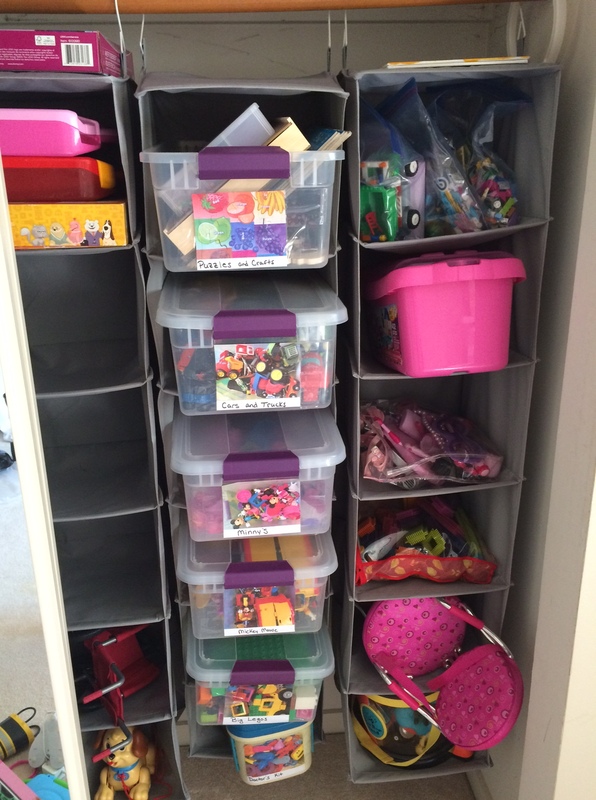 All you need is a little space and some imagination – now get organized! One of the benefits of having an office big enough to share is that Peter works from home so much more. It’s been so nice to cut the commute time and have him be able to be able to pop out for lunch and then back into the office. But there is a downside…we have totally opposite working styles. I like order. He likes chaos. I do not eat at my desk. He has full blown meals (I’m cringing while I type…). I like my papers stacked up neatly and I have a system of where each project goes. He has the paperwork tornado approach. What’s worse is that his craziness spills (sometimes literally) onto my stuff. Which if someone touching my stuff wasn’t enough, food stains aren’t really my gig. 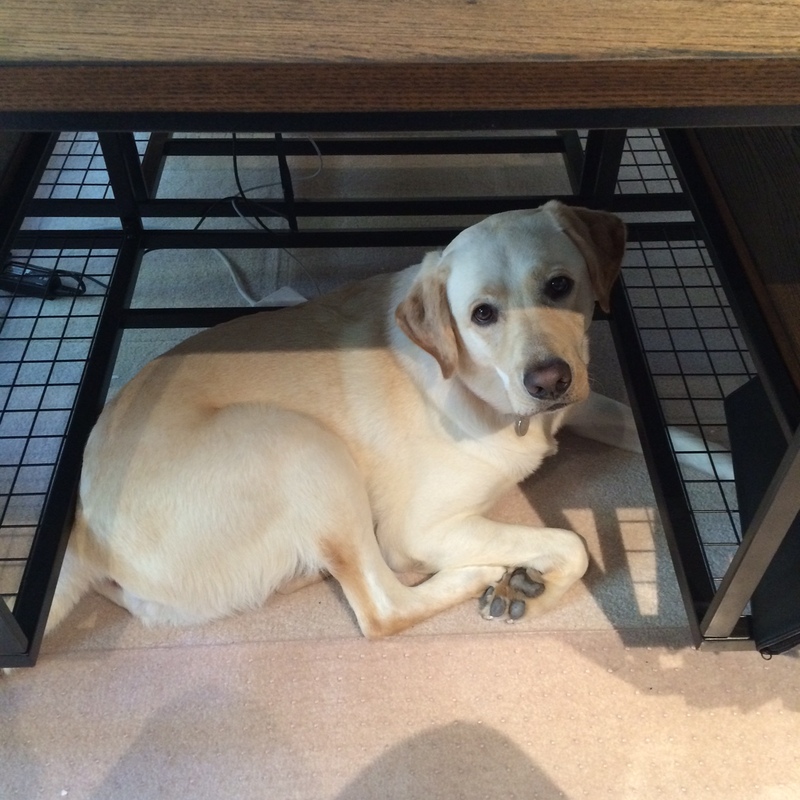 So for months I have been trying to find a new desk configuration that would work for both of us. Something where we could each have our space and storage and have a cohesive look to the office. That in itself is a challenge. Finding something that meets that criteria AND that we both agree on was damn near impossible. Every few days I would find myself digging around online looking for ideas. We couldn’t agree on anything. Finally one day I sent off an email with links to a few things I found that I liked (or could tolerate if he liked) and we got a hit. 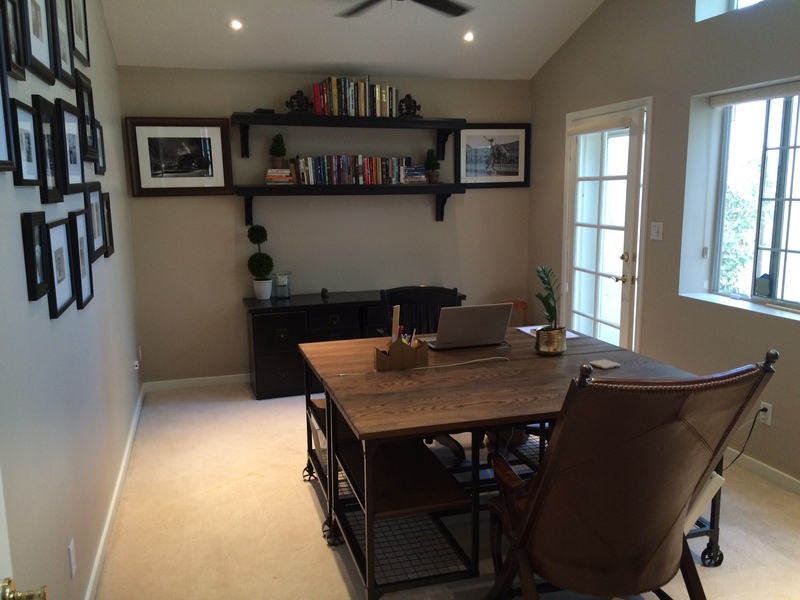 A great, rustic industrial desk from Target. The price wasn’t too bad to buy two of them – plus there was an online sale. Sold! I love the illusion that there’s just one desk. We were also able to reuse my current desk’s sides and reconfigure them into a console table. It made for a cheap solution to my need for drawers. I like storage and organization, but it all has to be out of sight. I am very visual so whatever I am working on, or need to work on, goes on the desk. But if too much is out, the clutter makes me itchy. It’s a delicate balance. 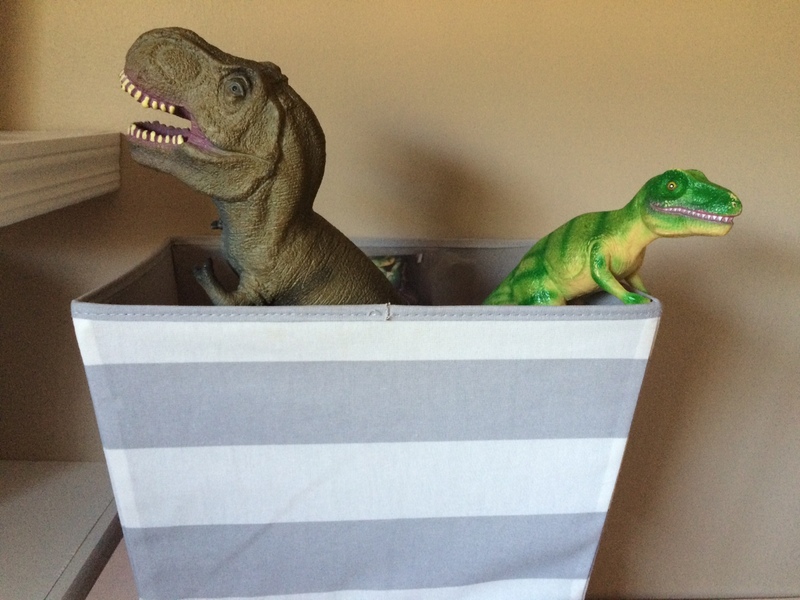 Now I have to get some clever storage bins for the shelves. I need something that looks nice but also is functional that can hold file folders…plus some cute desktop accessories…I see a trip to The Container Store in my future. I was so excited when we moved to the new house and decided to keep our kiddos in the same room and use the second room as a play room. I liked that they would have a bedroom that was for sleeping, reading and resting – and a play room that could be a total disaster that I could shut the door on. But alas, I can’t just shut the door. My hatred for all things cluttered, disorganized and messy, drives me to rally the kids into cleaning up the room daily. I can’t stand the clutter, the craziness! I think everyone in our house is all too familiar with my screeching demand for help to clean up. I do have a rule that if I have to help clean up, I throw things away. The panic that arises when one of the kids sees me put something in my pocket as it’s destined for the trash, usually spurs them into working faster…but not better. So I added some details to the play room that will hopefully help them be able to keep their toys organized and make clean up easier. I used these hanging storage racks from Target. They make cubes that fit in the drawers too that looked really nice, but I went with transparent bins with lids instead. I could only picture every bin being pulled out to discover what was inside…They work great because lots of different things fit in the spaces. Next I took a picture of what was in each bin. I printed them in 3×5 size and wrote the name of the items inside for Baylor. She is amazing at memorizing words when she sees the definition in pictures. 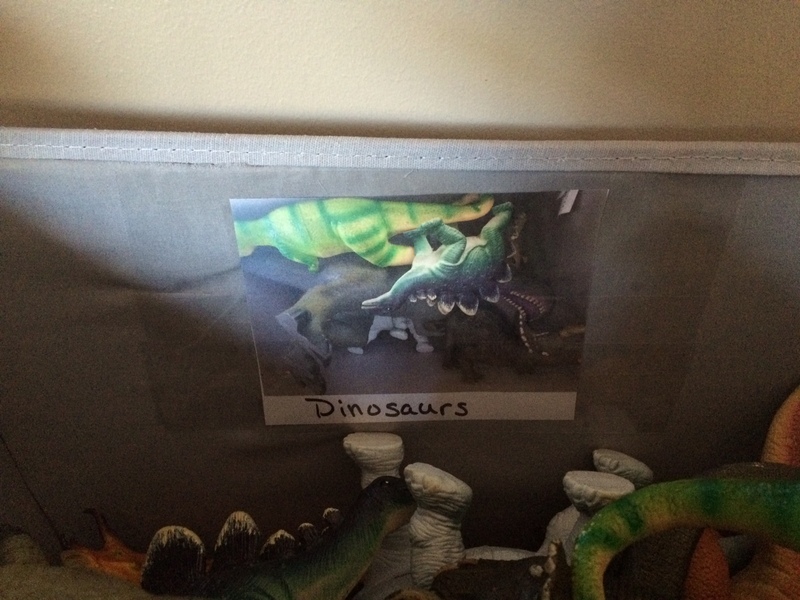 I also used the labels inside of the fabric bins in the playroom. 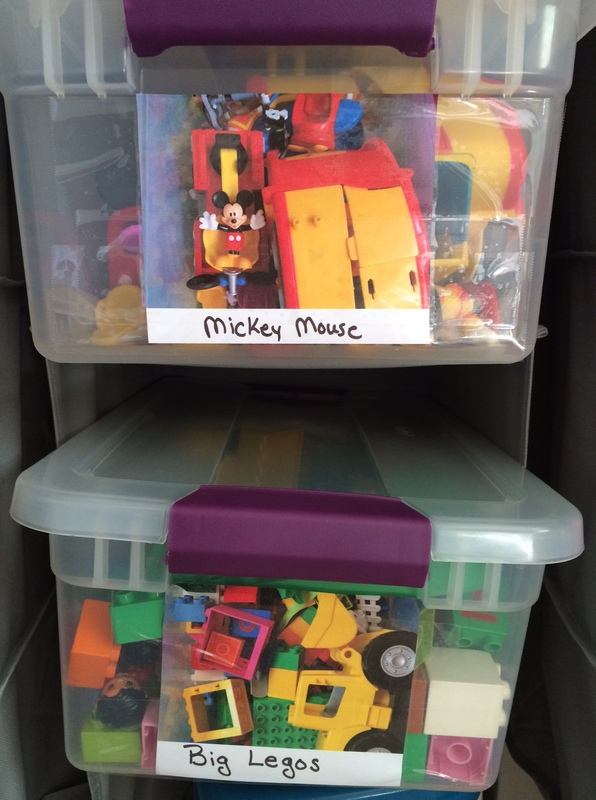 I think there are two ways you can organize the playroom – or any other kid space in your house: with or without your kids. Today’s project was done without them home. It allowed me to clean out some things and save my sanity by being able to quickly sort toys and have them actually stay where I put them. I take a trash bag and a “give away” bag in with me and as I clean, I sort. If you are worried about them noticing that something is missing, hide the bag in the closet for a few days. Or if you’re like me, you blame their disappearance on moving. If you are feeling brave and want to clean up clean out with your kids, talk about what the goal of the process is before you start. When Baylor was little, we talked a lot about how not all kids have toys like she does. We talked about how it was important to care for those less fortunate and one of the ways we can do that is by donating some of our toys. We never ask them to give away anything they really love, but we do ask them to consider whether or not they think that toy could make a child who has no toys, happy. I’m always surprised by both kid’s willingness to part with dolls, toys and games in the name of helping someone else. I always let them deliver the bag to the donation site too to complete the process. Peter and I were so conflicted about weather to start Baylor in kindergarten last year or this year. We decided she would only benefit from being a year older in kindergarten so we decided to wait. And boy am I glad we did. Not only have I seen her school skills take off in the last year, I’m now so grateful for that we had one more year of 3 day a week preschool. Because kindergarten? Is no joke. It’s 5 days a week of early mornings of a slow moving, slightly crabby kiddo. And bedtime. Sheesh. Trying to convince a six year old that she is indeed tired and in need of an on time bedtime is a struggle in itself. One of the things that makes our mornings go a lot smoother is prepping the night before. Lunches, uniforms, backpacks, water bottles, dog food, coffee…the list seems never ending. But if the morning starts with simply pushing START on the life line (I mean coffee maker), putting down a bowl of dog food and grabbing eggs from the fridge, it gives us a precious 10 minutes that can save our morning. Combine all ingredients except fruit and almonds. 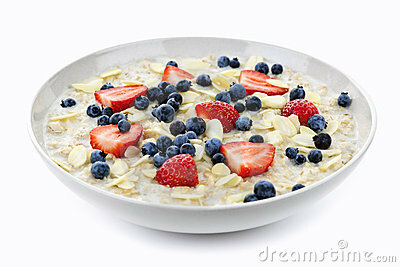 Let sit in the refrigerator over night and top with fruit and or nuts before serving. Make it in a disposable cup and it’s a quick car breakfast. I also buy an extra dozen eggs and hard boil them (place all dozen in cold water. Bring to a boil and cook for 10 minutes. Remove from water and place in the refrigerator. The shell will peel easily and they won’t be hot when you eat them). It’s a quick way to get everyone some protein and there’s no prep time. Lastly, I always keep my favorite green smoothies in disposable cups for easy grab and go.